« Doing small things in a great way . . .
Beannachtaí lá Fhéile Pádraig Duit, A Sheáin Léitheoirí! Blessings of St. Patrick’s Day to You, Dear Readers! As I’ve mentioned a few times now, I have a mostly Irish heritage. So today is a fun and festive day in my family when we celebrate with food and friends! Here is what I put in my crock pot this morning. As opposed to a London Broil, I like to call this a Dublin Boil. I can’t wait to get home and enjoy this overflowing, bountiful Irish feast! 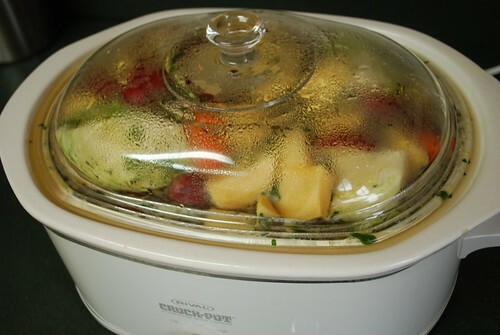 Spray the inside of your 8-10 quart crock pot with cooking spray. Place the corned beef brisket in the crock pot. Add the beer and enough of the water to cover the beef. Next, add the bay leaves, the peppercorns, the parsley, the Worcestershire, and the salt and pepper. Also add the potatoes and the carrots to the pot. In a heavy skillet, heat the butter over medium heat until melted. Add the garlic, the leeks, and the yellow onion, sautéing for 4-5 minutes. 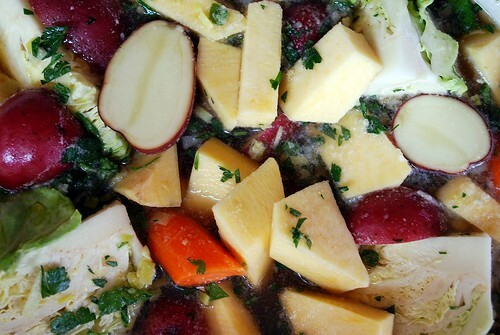 Add these veggies to the crock pot. Cover the pot and cook on low for 8-10 hours, or until the meat is very tender. In the last hour or two of cooking, add the turnips and the cabbage. Taste the broth and season as needed with the salt and pepper. Remove the bay leaf before serving. Serve hot in generous bowls with a wedge of Irish Soda Bread.